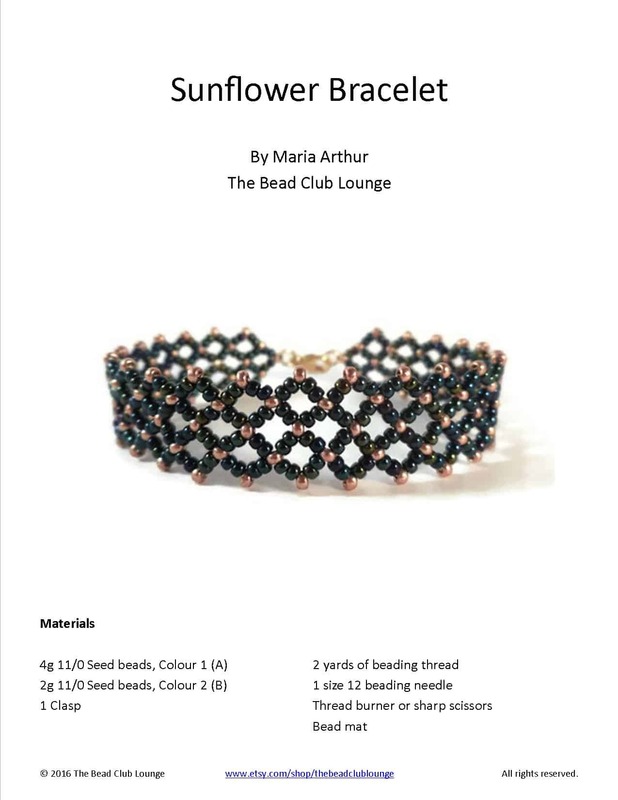 Reading beading patterns can be a challenge for beginners. If you struggle to understand written tutorials, use these tips to create DIY jewelry projects. Knowing how to read beading patterns is essential if you want to create beaded jewelry. They give you all the instructions you need. Some include photos, while others have step-by-step diagrams. If you struggle to read beading patterns, know that you’re not alone! Lots of people have this same problem. I want to give you a few tips that can help make it a little easier. Are written patterns even right for you? If you’re a very visual person, you may find you understand things better when someone shows you how to do them. In that case, you might follow video tutorials way better than you do written ones. Was the pattern created by someone you’re familiar with? Do you usually understand their tutorials? Are there reviews? Places like Etsy are great to shop for patterns because you can benefit from other people’s experiences before you buy. Two of my favourite Etsy shops for comprehensive tutorials are Ellad and Simple Bead Patterns. Read the details—Are there step-by-step photos or diagrams illustrating what you need to do? Which one do you usually understand better? Do a little research and see if the pattern will be right for you. All patterns should have a list of required materials. Some of them may have specific details that you should adhere to. For example, if 11/0 Delicas are listed instead of 11/0 seed beads, make sure you use Delica beads. Substitutions may give your finished piece a very different look to what you expect. When you change the design, you may find it challenging to follow the tutorial. If you can’t source a particular type of bead, don’t be afraid to ask the designer. They may not know for sure but they may be able to recommend another bead you can try or, at the very least, where you can purchase the materials. Now, this is one mistake I’ve seen many beginners make in classes I’ve taught over the years. If you’re trying a new pattern, hold your beadwork in the same orientation as shown in the photo or diagram. Also, take your needle through the beads in the same direction as demonstrated. Doing this small thing can eliminate so much confusion and frustration. The instructions will make a lot more sense if you’re following them to the letter. Are you a beginner or do you have lots of experience with different stitches? Take a look at the skill level required to complete the pattern. If it’s not provided, ask a question. If you have just begun learning, stay away from intermediate to advanced patterns. Sometimes, the creator will assume you have prior knowledge of a stitch and will not delve into the basics you need to know. There are some terms that you may encounter while reading beading patterns. Learn the definition of these so that when you stumble across them, you will understand the instructions. Also, make sure you learn the basics of various beading techniques. I did this when I started making jewelry and it made my life a whole lot simpler. Beading was much more fun because I was comfortable with beginner stitches before attempting more complicated beading patterns. I highly recommend using the book, Mastering Beadwork by Carol Huber Cypher. It’s an excellent book that I would recommend to anyone. There’s a beadwork glossary that explains the meaning of commonly-used terms, as well as an introduction to techniques like how to add thread and make knots. Of course, the book is chock-full of beading patterns too. Understanding written tutorials takes practice but as long as you follow the tips I have given you here, you’ll find the process a lot easier! one thing i’ve found frustrating, and not at all helpful, is a diagram with different colors of thread for each thread path, they overlap each other and make it hard for me to follow. I’ve ordered beading books only to find this is the way diagrams are done. If you are a visual person this type of diagram can be as bad as no diagram at all. Cally, I actually haven’t done a ton of beading patterns with diagrams to be honest. The ones that I have tried, that had different colours representing thread paths, usually were Right Angle Weave tutorials where you needed two needles. I’m not sure if that was the case with the books you purchased. When they create patterns using multi colored multiple thread paths they don’t take into consideration how those colors appear when printed or viewed on a screen. There have been times where they will use black, blue and maybe a dark green and the final product doesn’t represent those color variations clearly enough for someone to follow. I cancelled my subscription to a popular beading magazine for that very reason. You’re so right! It’s really important to be able to follow the thread path.